Designed to remove excess surface penetrant, ZR-10E minimizes surface background during Method D fluorescent penetrant testing while protecting indication integrity in critical component inspections. This Method D remover reduces fluorescent background on rough surfaces and minimizes penetrant bleed-out from hollow parts. 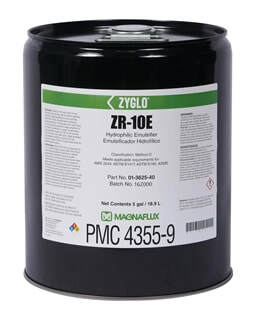 ZR-10E is tested and approved to AMS 2644 to work with Magnaflux PE penetrants ZL-2C Level 2, ZL-27A Level 3and ZL-37 Level 4 for verified penetrant system reliability. ZR-10E provides long tank life and excellent solution consistency for dependable, long-lasting performance in a variety of applications. ZR-10E is listed on the QPL SAE AMS 2644 Qualified Product List and is approved for use by Pratt & Whitney. Turbine engine blades, disks, etc.